Sign up with 70-513 for getting incredible online courses 000-978 exam and 642-467. We also provide best exam 70-642 and 1y0-a18 vce certification with guaranteed success. EDITOR: We have some important new information on the TimeWave predictions at the end of this article. So many people did not read this story when it was first published on viewzone that we thought it important to repost it with the new data. I have a very good friend named Johnny who lives in Patagonia, one of the safest places on the planet. He often sends me ideas for stories on viewzone. A while back he tried to get me interested in something called the "Time Wave Theory." My initial reaction was to pass on the story. A theory about time? Einstein couldn't define what time is (or was, or will be). The Timewave theory, put forth by Terence McKenna [right], is further complicated by the fact that he is dead, and that much of what he learned about the theory is alleged to have come to him during shamanic visionary states while he was living in the Amazon jungle. Hmmm. But The Timewave Theory is perhaps the hottest topic on the internet today. Many reputable scientists and physicists have embraced it. It has broken the barriers between esoteric philosophy and pragmaticism. And, as you will see, its discovery is predicted within the theory itself. Lots of trendy websites have given summaries of McKenna's theories, especially as they relate to 2012, but hardly anyone has explained the theory in a logical way. Since that is my raison d'etre here on viewzone, I will attempt to do this now. The biography of Terence McKenna is fascinating and certainly worth exploring, but I will leave that for later. Our story begins in China about 4000 years ago with a phenomenon called the I-Ching. The Chinese people are great at understanding abstractions. Their writing consists of symbols that suggest an idea or concept rather than phonetic sounds, like English. With hundreds of different dialects spoken in China, often people living in a neighboring village cannot understand the spoken language of their countrymen. Although the sounds and phonetics may vary, the written Chinese symbols are understood by everyone. Why is this important? The I-Ching is a system for what the Western mind would call "fortune telling." But instead of being able to tell you who you will marry, when you will die or next week's lottery numbers, the I-Ching predicts the pattern of events which will govern and shape your destiny. It's an abstract vignette of a universal influence for a specific block of time. In the I-Ching, there are patterns which are composed of six possibilities, represented by either a broken line (yin) or a solid line (yang). By simple mathematics it is easy to understand that two possible patterns, expressed in a matrix of six (called a hexagram), yield a possibility of exactly 64 different hexagrams. Typically, if you are in Asia and engage the I-Ching, you will toss a coin six times and record the heads or tails (yin or yang) and arrive at one of these 64 hexagrams. By referencing the Book of I-Ching, you will be able to ascertain the flow of events that governs your present and future life. The results will not be specific -- it's more of a kind of weather report describing the outcome of your actions. So why is this important to the Timewave Theory? It's not, really. The I-Ching is a kind of parlor game that evolved from something deeper and more significant. The true basis of the I-Ching was understood many thousands of years ago and was lost in centuries of ignorance and political upheaval -- that is until Terence McKenna accidentally stumbled upon it in the 1970s. Examining the King Wen I-Ching hexagrams, McKenna noticed an obvious pattern. The first hexagram contains six solid lines. Hexagram number two has six broken lines. Hexagrams 3 and 4 appear to be similar pairs that have been rotated 180 degrees. The same is true for most of the other hexagrams -- they are pairs in which the second hexagram has been rotated 180 degrees. McKenna noticed that sometimes, when a hexagram was supposed to be rotated, the rotation would not change the configuration. An example of this can be seen in hexagram 27. It also is the case with seven other hexagrams (#1, 2, 28, 29, 30, 61 and 62). When this happens there is a different rule that applies. The following hexagram is exactly opposite -- the yins become yangs and visa versa. He plotted these changes on a graph and arrived at a unique pattern. But he didn't make much sense out of this. He needed to understand why the I-Ching was made of six lines and why was it arranged in pairs that were rotated 180 degrees. The breakthrough came when he noticed that the extreme left and right of the graph contained a saw-tooth pattern. If he copied the graph, rotated it 180 degrees and superimposed it on the original graph it meshed perfectly "like the dove tail of a cabinet maker." To incorporate the six lines, McKenna repeated this new graph six times and superimposed it on the single plot. To incorporate the phenomenon of "pairs" of hexagrams, he repeated the pattern two times and superimposed it on the other two graphs. Eventually he arrived at a complex shape containing all three graphs. But what did this mean? With a computer it was possible to combine the peaks and valleys and arrive at an average graph (see math at http://www.fractal-timewave.com/math_twz.htm), representing the change of the 64 hexagrams and, as McKenna believed, revealing the secret encoded in their original design. This graph has become known as the Timewave. 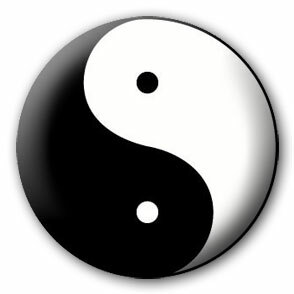 In Asian Taoism philosophy the concept of opposing phenomena is represented by the Yin and Yang. Both are always present in everything, yet the amount of influence of each varies over time. In Taoist philosophy, yin and yang arise together from an initial quiescence or emptiness (wuji, sometimes symbolized by an empty circle), and continue moving in tandem until quiescence is reached again. For instance, dropping a stone in a calm pool of water will simultaneously raise waves and lower troughs between them, and this alternation of high and low points in the water will radiate outward until the movement dissipates and the pool is calm once more. Yin–yang, thus, are always opposite and equal qualities. Further, whenever one quality reaches its peak it will naturally begin to transform into the opposite quality: grain that reaches its full height in summer (fully yang) will produce seeds and die back in winter (fully yin) in an endless cycle. It is impossible to talk about yin or yang without some reference to the opposite, since yin–yang are bound together as parts of a mutual whole. A race with only men or only women would disappear in a single generation; but men and women together create new generations that allow the race they mutually create (and mutually come from) to survive. The interaction of the two gives birth to things. Yin and yang transform each other: like an undertow in the ocean, every advance is complemented by a retreat, and every rise transforms into a fall. Thus, a seed will sprout from the earth and grow upwards towards the sky - an intrinsically yang movement. Then when it reaches its full potential height it will descend. The individual lines of the I-Ching are made up of both Yin (broken lines) and Yang (solid lines). The concept of change and balance is inherent in the hexagrams. McKenna understood that his final graph must contain the "fingerprint" of change contained in time itself. The peaks represent the abstraction of "stasis" or habitual stability, while the valleys represent novelty or change. A fractal is a shape produced by plotting mathematical data which repeats whether viewed on a macro or micro scale. 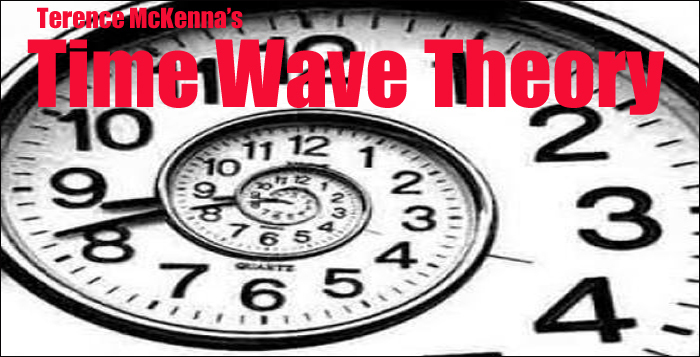 McKenna realized that his Time Wave had this special characteristic. The entire graph, representing the beginning and end of time, can be seen duplicated when one looks at a smaller span of time. In the example above the same pattern can be seen for plotting two differnt eras. 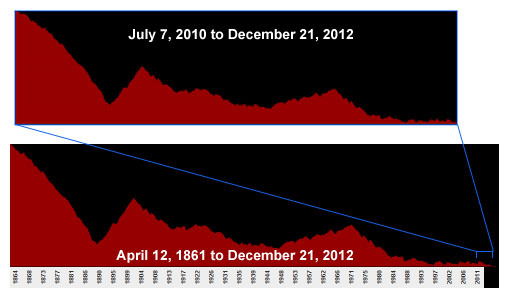 The bottom plot spans almost 150 years while the top plot spans about 1.5 years. The drama of novelty and habit plays out, according to the Timewave, in a specific and orderly pattern. Because this pattern is a fractal, the ups and downs of the timewave apply equally to a long epoch, like the emergence of life on our panet, and a short epoch, like the lifetime of an individual. McKenna liked to joke about this phenomenon in his lectures. He would use the example of the fall of the Roman Empire, saying that it followed the same pattern -- habit and novelty -- as when he vacuumed his living room. Understanding this "fractal" concept makes it easier to understand why the I-Ching was used to predict the outcome of current events in Chinese philosophy. If one could learn where on the Timewave they were then they could infer whether novelty or habit were in play. As the Timewave pattern moves through time, the fractals become smaller and smaller. What took eons of time to complete next takes only thousands of years, then hundreds, then days, minutes, seconds. As we approach the zero point on the grand Timewave, waves of novelty and habit change more rapidly. This can appear chaotic to our sense of time but it is because the very pattern of time IS speeding up. Indeed the knowledge and understanding that we have accomplished in the last hundred years of civilization far surpasses the achievements of many thousands of years before. It is not so surprising then that the Timewave theory should be discovered, or perhaps re-discovered, at this fast paced era near the end of time. Novelty is characterized by increased activity and options. For humans, this usually follows some great discovery or event which changes our behavior. Imagine an ant's nest where workers go about their daily routine of foraging for food. All of a sudden a sugar cube is dropped on the ant mound and suddenly the behavior of the nest changes to take advantage of this new opportunity. If the discovery is significant enough the ant colony may have enough food for many weeks, thereby ushering in a period of stability and wellbeing. Novelty ushers in stability and visa versa. Novelty and stability may appear opposite but they are always present in time. The Timewave plots the move from one direction to the other. Moving up indicates a gradual increase in stability and organization while a downward curve shows that some new factors are influencing change. It's a continuous ebb and flow. I thought it would be helpful to take a look at the Timewave for the past two decades. The above timewave begins on February 1992 and ends on December 21, 2012. Yes, it's "doomsday" but we'll talk about that later. I have marked some events that happened close to the significant turning points -- either just before a downward or upward curve. I will let you decide if these events validate their position on the graph. When he finally arrived at the shape of the Timewave, McKenna then had to superimpose it on historical events. He placed the beginning of the wave at the theoretical beginning of the universe, more than 15 billion years ago. Here, the Timewave graph began at zero and spiked up to reach a high degree of organization. As he plotted the wave he realized that it eventually reached zero at the end. Further, this end was in our present era! The last harmonic of the wave has a duration of 67.29 years, marked again by some dramatic event at the onset of the pattern. At first McKenna placed this event with the dropping of the atomic bomb on Hiroshima. This worked out to the graph reaching zero in mid-November of 2012. Later, when he learned of the end date of the Mayan calendar, he adjusted the wave to coincide with this time. According to the Timewave theory, on December 21, 2012 we will be in the unique position in time where we will experience maximum novelty -- maximum potential for change. Not since the birth of our universe has this happened. What will follow this date is something that we cannot imagine. The next day, if time recycles, will usher in incredible order and organization. Will we be part of this? Following the death of his mother in 1971, Terence, his brother Dennis, and three friends traveled to the Colombian Amazon in search of oo-koo-he, a plant preparation containing DMT. Instead of oo-koo-he they found various forms of ayahuasca and gigantic psilocybe cubensis which became the new focus of the expedition. In La Chorrera, at the urging of his brother, he allowed himself to be the subject of a psychedelic experiment which he claimed put him in contact with Logos: an informative, divine voice he believed was universal to visionary religious experience. The revelations of this voice, and his brother's peculiar experience during the experiment, prompted him to explore the structure of an early form of the I Ching, which led to his "Novelty Theory". These ideas were explored extensively by Terence and Dennis in their 1975 book The Invisible Landscape - Mind Hallucinogens and The I Ching. In the early 1980s, McKenna began to speak publicly on the topic of psychedelic drugs, lecturing extensively and conducting weekend workshops. Timothy Leary once introduced him as "one of the five or six most important people on the planet". He soon became a fixture of popular counterculture, and his popularity continued to grow, culminating in the early to mid 1990s with the publication of several books such as True Hallucinations (which relates the tale of his 1971 experience at La Chorrera), Food of the Gods and The Archaic Revival. He became a popular personality in the psychedelic rave/dance scene of the early 1990s, with frequent spoken word performances at raves and contributions to psychedelic and goa trance albums by The Shamen, Spacetime Continuum, Alien Project, Capsula, Entheogenic, Zuvuya, Shpongle, and Shakti Twins. His speeches were (and continue to be) sampled by many others. In 1994 he appeared as a speaker at the Starwood Festival, which was documented in the book Tripping by Charles Hayes (his lectures were produced on both cassette tape and CD). McKenna was a contemporary and colleague of chaos mathematician Ralph Abraham and biologist Rupert Sheldrake (creator of the theory of "morphogenetic fields", not to be confused with the mainstream usage of the same term), and conducted several public debates known as trialogues with them, from the late 1980s up until his death. Books which contained transcriptions of some of these events were published. He was also a friend and associate of Ralph Metzner, Nicole Maxwell, and Riane Eisler, participating in joint workshops and symposia with them. He was a personal friend of Tom Robbins, and influenced the thought of numerous scientists, writers, artists, and entertainers, including comedian Bill Hicks, whose routines concerning psychedelic drugs drew heavily from McKenna's works. He is also the inspiration for the Twin Peaks character Dr. Jacoby. McKenna also co-founded Botanical Dimensions with Kathleen Harrison (ethnobotanist) (his colleague and wife of 17 years), a non-profit ethnobotanical preserve on the island of Hawaii, where he lived for many years before he died. Before moving to Hawaii permanently, McKenna split his time between Hawaii and a town called Occidental, located in the redwood-studded hills of Sonoma County, California, a town unique for its high concentration of artistic notables, including Tom Waits and Mickey Hart. 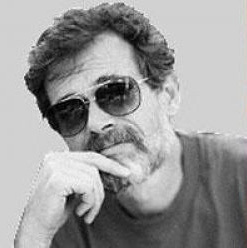 Of all his many accomplishments, Terence McKenna will be remembered for his discovery of the Timewave Novelty Theory and his unparalleled ability to describe this theory to others in a way that made it interesting, understandable and congruent with both physics and religion. As physicists look deeper and further in to the infinity of quantum mechanics, McKenna's work on the structure of time is gaining more respect and application. While some conservative minds will condemn his use of mind-altering drugs, it is perhaps because of the other-worldly nature of these psychedelic experiences that the abstractions of time were revealed. First, I don't want to make this too complex. If you're like me, keeping your credit card in balance is tough enough to do. Although I have spent hours trying to understand the complexities of the Time Wave Theory, I can grasp enough to write about it in the most general way. One of the steps in McKenna's process that I described in the previous article -- where he took the first graph and reversed it -- has always bothered me. When he placed this reversed graph on top of the existing graph he aligned it in such a way that the "teeth" meshed. But they were not meshed exactly and this left little bits of the graph on both ends slightly misaligned with each other. Apparently someone else noticed this. A British mathematician named Mathew Watkins saw this discrepancy and decided to be more precise with this alignment. He aligned the reverse graph with the existing graph and let the numbers decide what happened. It wasn't visually pretty like McKenna's TimeWave, but it was mathematically sound. The result is what has become known as the Watkins Objection, and the resulting Time Wave pattern is only slightly different. But when you are dealing with things like time and events, a small difference can be quite significant. Above: the standard model proposed by McKenna. Above: The Watkins model showing adjusted calculations. In the standard model we see that there is an event which will happen around May 9th which will begin a period of habitual behavior that culminates on July 8th. From July 9th onward we are in a steep plunge of novelty which placed everyone in a state of confusion as they adjust to some new situation that has been thrust upon humanity. Around January 16th of 2011 we get a small reprieve and begin to cope with the new situation but in March 22 of 2011 something again happens that causes unrest and novelty. There are a few attempts to adjust to normalcy after this date, but eventually the situation becomes too much and absolute novelty overcomes habit on 12/21/2012. In the revised Watkins model we see that May 9th is also a significant day, marking our climb to habitual life that, like the McKenna model, changes on July 8th. But instead of a sharp decline into novelty, the Watkins model has a sawtooth pattern of adjustment with increasing habitual behavior, suggesting that humanity is coping well with some change. This happens until November 14th, at which time a free fall into novelty happens which is even greater than the one predicted by McKenna. It goes straight down until January 16, 2011. After January 16th there is a brief period of recovery and habitual behavior that reaches it peak on March 22, 2011. Then, something happens that takes humanity to maximum novelty on 12,21,2012. So, while the significant dates remain the same, the pattern of habitual behavior vs. coping with new situations in new ways is slightly different. One thing that was discovered with the Watkins model is that the Time Wave has absolute novelty both at the beginning and the end of the wave. This suggests that there might be some cyclical nature to the wave, and time itself. Why does this matter, you may ask, since there are many obvious differences between the two waves -- what is the significance of this difference? For the standard model wave, it has been argued that the zero value at the end of the waveform implies some kind of singularity at the end of the process -- or at the end of time. This revised wave is implying, however, that there may be singularities at both ends of the continuum. This is also an argument for a closed system that may be undergoing some kind of cyclic renewal process -- perhaps each cycle expressing ever higher ordered states of complex form, or Novelty. 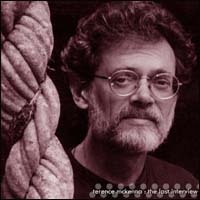 Thanks for your article on Terence McKenna's Time-Wave Theory. There's more to discuss. I met Terence on the Big Island in July 1988 at a Physical Immortality Conference before he was very well known, but nonetheless a dynamic and inspiring, extremely articulate and compelling speaker. He invited a few of us to his home to see his Botanical Reserve and we hung out with him after touring it, in his hot tub with his son and we talked about everything, which he was excelled at. In addition to being exceedingly bright, he was also exceedingly funny. He had a real penchant for dry humor, the paradoxical and the ironic. Painting a picture of Terence without including these elements does not capture a true picture of Terence. We maintained a loose contact over the next few years, and in 1992, I took a workshop with him in NYC attended by all of about 15 of us, focusing on entheogens, or better, the ingestion of sacred plants for consciousness expansion and then the following year at the Open Center in NYC, attended by about 20 of us, this time on time, yes, the Timewave Theory. It was and is fascinating, and also, as he said, he was always looking to disprove it and testing it every which way. In around 1994, a year after I began producing and hosting a NYC-based, educational TV show called A Better World (www.abetterworld.net) I invited Terence on as a guest (it's on DVD through the website) and this was a fascinating interview focusing on the Time-Wave software. I can tell you why Timothy Leary said of him that he was one of the greatest minds of the 20th century: because it's true. His understanding, as expressed in his lectures and books, show a vast, holistic perspective of the interconnectedness of life, love, plants and the inner workings of the Universe. It's worth any interested party to get hold of his work and really bear down on it. I'm telling you all of this to say that open and experimental as he was, he himself was surprised when it worked but always assumed that there would be found some flaw in it eventually. In short, playful and serious as he was about it, he also seemed to entertain the potential for its being shown at some point to be inaccurate or inherently flawed. I don't know of anyone who has disproven it, but I do know of someone who may have exceeded it. At the seminar in 1993, a small group of us joined Terence for lunch. One fellow, who sat next to Terence, David Katzmire, spent most of the lunch downloading to Terence a theory of time that he developed called Kalarhythms. He was actually originally looking to plot cycles of stocks rising and falling, but ended up re-dating the birth of the U.S. and evolving a time-cycle theory that is globally-encompassing and highly predictive with accuracy across a few parameters: there's a physical, emotional, mental/intellectual and a spiritual cycle. These interweave across time per their own cycles and at their intersection, rather interesting dynamics predictably arise. At that lunch, Terence not only politely listened, but seemed to be quite intrigued, if not entranced, by this other approach to the subject. It factored in variables that Terence seemingly hadn't considered, and he accorded David's theory a good deal of consideration. It was quite an interesting lunch. Thereafter, yes, I spent some more time with Terence at lectures, workshops, on my show, here and there, and I deeply value this precious time with him, especially in light of his passing only a few short years thereafter, much to the dismay of those of us who knew him even minimally. He was brilliant and helped to open the minds of thousands due to his alluring, humorous and poetic style of extraordinary delivery. Open as he was in so many ways, curiously, when it came to treatment of his brain tumor, he seemed rather committed to the allopathic approach and didn't seem to give much attention to alternatives, despite his Berkelely-based, alternative and progressive thinking that characterized him. The work of David Katzmire, which I discovered, ironically, through attending one of Terence's workshops, at this point is much less known but no less meritorious. In fact, it is a growing body of evidence about the nature of time cycles and how they can help us generate a greater perspective on what's currently going on as novelty does increase, as time is speeding up, and during a time when the first part of chaos theory, namely, the rein of chaos, seems dominant. Of course, the use of Kalarhythms, I have found, and have further corroborated through my series of interview with Katzmire, both on A Better World TV and Radio over the past few years, has deepened my own understanding of 'what's happening' and the underlying order beneath it. And I would turn your and your audience's attention in that direction to learn more about it. From my view, this should be the more hotly debated time-cycle theory on the net because even Terence recognized its value, even possibly as a more thorough approach to understanding time cycles than his own. Not to mention, its author, David Katzmire, is very much with us, to further expand the work and to educate us, parry with us, about it with artful glee. The interested reader can find a radio show of mine with David as a free download at: www.abetterworld.net under the Media link (and just scroll down until you see it) and on DVD at the same site under the Store link(not free) and a few minutes of each on YouTube at: abetterworldtvshow. I hold Terence McKenna to be "penseur extraordinaire" as we used to refer to him, and his contribution as a thinker/philosopher/educator/provocateur invaluable. What he helped us see about the intimate relationship between psyche and soma, mind and plant and planet is nothing short of brilliant, and the more who know of him/his work, the more sentient life benefits. He is one of my favorite people--and guests--of all time. But when it comes to understanding cycles of time, I would refer you to the work of Kalarhythms. I hope this missive is somewhat informative and helpful. Please let me know if I can provide you with any further information. There is a question of why T. McKenna, as such a farsighted man, didn't avail himself of say, energy medicine, or another of the proven cures against cancer, e.g essiac, a herbal cure. (I have tried this on a skin cancer. It got rid of the cancer, as per the prognosis.) Perhaps he wanted it that way because his mission goals had been achieved; meaning that he could Go Home!! This is simply another angle, a possibility I am looking at, something already outlined in Songs Of Power. This has to do directly with the activation of the mechanism which will set in motion the acceleration of the Harmonic Vibrations, all the harmonic scale, as part of the RAISING OF THE LEVEL OF CONSCIOUSNESS. You see, it could be that the raising of the level of consciousness, ties in nicely with 12/21/2012. If all consciousness is raised, that just could usher in the new beginning, as has been hinted at, (and obliquely stated in Omens & Hindsight, which encapsulates excerpts from Songs Of Power; obtainable at bookhabit.com), by way of the building of the peaks of habituation, then the abrupt swooping rush via novelty into troughs, perhaps into a new situation, whereby the rate of vibration is induced to accelerate; thereby is the uplifting of all consciousness accomplished. Sigh!! It's only an intense wish, a warrior's wish. Is it so foolish to pray that all will be uplifted into a new paradigm? A type of existence wherein all are benefited in every conceivable way? Anyway, that is the bones of what I term my Prayer, my Karakea. And why should not my Life be my Prayer also? My Karakea!! Every good I could ever wish for myself I wish for everyone and everything that can sense the winds of change- the Four Winds, Te Nga Hoe Wha. So I pray to help make it so. Not far from where I live, is an ancient place of Power, Te Meringa Te Kakara. Now the ground might be about prepared so the changes will take place in accord with the raising of the frequency of vibration, which causes the raising of consciousness to a higher level of vibration. Everything is touched and all that is touched with these all pervading vibrations is changed, is raised to a higher or purer vibration. Maybe not, there may be many computations. Still, I live my Prayer and I'll see where it takes me. Mes Braves, Bon Voyage - Happy Landings.